Sitting in a park in the Basque city, he noticed signs for a free municipal Wi-Fi service that would allow him to get online with his smartphone without the risk of incurring a huge roaming bill from his mobile operator. Quinn was particularly taken with the ease with which he was able to get online. “There was no registration,” says Quinn. “You just see the network and when you connect to it an advertisement is displayed”. So taken was Quinn with Bilbao’s example that he tabled a motion to Dublin City Council to create a similar scheme. The proposal, which called on the city manager to consider how to provide free wireless internet access in Dublin’s “public parks and squares”, was passed last Monday night. The city manager is due to report back by the end of the month, leading to speculation that such a scheme could be in place as early as next year. Un servicio que viene especialmente bien a los visitantes de la ciudad que pueden acceder gracias a este servicio a sus cuentas de correo o a informaciones sobre la ciudad, sin tener que sufrir las elevadas tarifas que las compañías telefónicas cobran por el roaming de datos. Como decimos muchas veces, no deja de sorprendernos la capacidad de liderazgo de nuestro pequeño país. Free public Wi-Fi: a capital idea? T’S A constant of the urban landscape: the smartphone user staring into a screen as the world passes by on the street around them. Whether it’s updating Facebook, looking for directions or checking a football score, the Irish have embraced ubiquitous internet connections. 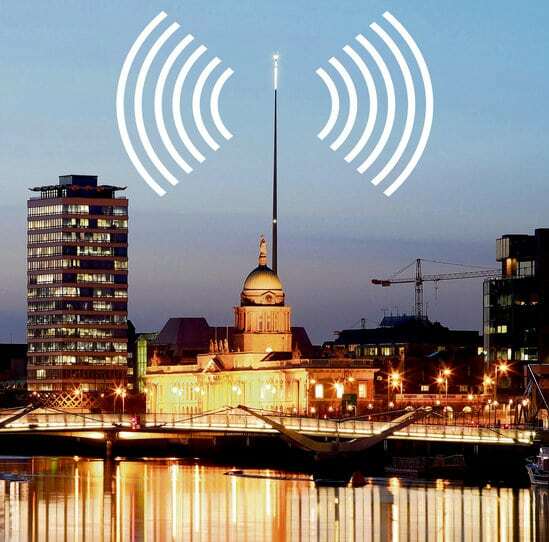 Under a proposal being considered by Dublin City Council to provide free wireless internet coverage in public spaces, the absorbed smartphone user could become an even more common phenomenon on the capital’s streets.